Osceola County experienced rapid growth in 2017 and that growth has continued in 2018, according to preliminary tax roll data. Total market value in the county rose almost 10% to $38.9 billion in 2018. 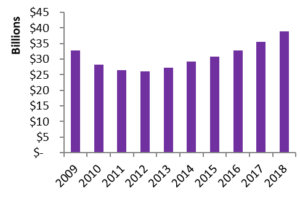 Also, new construction market value saw a 21% increase from 2017 to 2018, with preliminary values at just under $1.19 billion, hitting a 9-year high. TRIM Notices, or the Notice of Proposed Property Taxes, were mailed on, Friday, August 17th, so check your mailboxes! 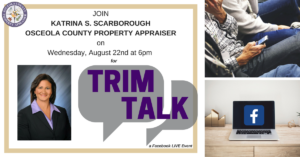 To answer your most frequently asked questions about TRIM notices, Osceola County Property Appraiser Katrina Scarborough will be hosting a Facebook Live event on Wednesday, August 22nd, 2018 at 6pm. Submit your questions through Facebook messenger or email them to info@property-appraiser.org by 12pm on August 22nd and tune in at 6pm to have your questions answered!